I’m writing to share some thoughts on today’s economic outlook, looking beyond the headlines and to bring you up to speed on stock markets. First a short summary of stock market performance in 2010 to date. Markets in the last three months saw a continuation of the roller-coaster like turbulence of the past couple of years. After a strong first quarter and a big pullback in the second quarter, July saw a solid recovery in global markets. This was followed by weak performance in August, and September (historically a troublesome month for markets) saw a big bounce back (the U.S. market experienced the best September since 1939). As a whole, global markets were up 9% for the third quarter and are up 2% in 2010 to date. Source: MCSI index. All returns are in local currency. One of the keys to success for investors is maintaining emotional equilibrium, preventing the highs from being too high and the lows from being too low. Today, many Canadians are pessimistic about the American and global economies driven by daunting headlines about slow economic growth, depressed housing prices, high unemployment and deficit problems in the U.S. and Europe. This pessimism is amplified by the media coverage given to voices of gloom such as Nouriel Roubini and David Rosenberg. As a result, it’s easy to miss some of the good news beyond the headlines. That’s why a conference that took place in mid September is important, as it provided some offsetting perspective on the mid and long term positives for the United States and globally. Speaking to 2000 business and political leaders at “The Big Sky Conference” in Montana, here are comments from Warren Buffett, Steve Ballmer of Microsoft and GE’s Jeff Immelt. Almost 60% said their country’s economy is in recovery. Most expect profits to rise from last year. And nearly 40% expect to hire employees by the end of 2010. It’s not realistic to suggest there won’t be challenges ahead, both for global economies and for stock markets. Overall, we remain positive on the long-term outlook for the equity market. Concerns about the economy have caused many investors to make large allocations to cash and bonds. If you are in that category, I believe now is a good time to reexamine your strategy. As always, should you have any questions on this post or any other matter, my team and I are always happy to take your calls. What Will 2008 Mean To You? 2008 will definitely go down as one of the most dramatic years of our lifetimes. Whether it was political (Google: Canada+coalition, Google: Obama+McCain), economical (Google: subprime, Google: bailout), or environmental (Google: cold+snap+Canada), something happened to put a shiver down anyone’s spine! So what does it all mean to you and me? If you had money invested in the markets at the beginning of the year, you likely had less at the end. The global economic meltdown is now considered the worst since the Great Depression, and had such broad impact that there was literally no “safe haven”, no country or industry not affected. The silver lining around this dark cloud is that all of these assets are now trading at much lower prices than they were a year ago; for anyone putting money into the markets, this may end up being the greatest buying opportunity of our lives. Those of us who have lost money last year, now is the best time to sit down with a financial advisor (we know a couple good ones here) and look at rebalancing your portfolio. Sometimes when investors see an asset drop in value, their immediate reaction is to sell it and move whatever money is left into another asset that has been doing well. 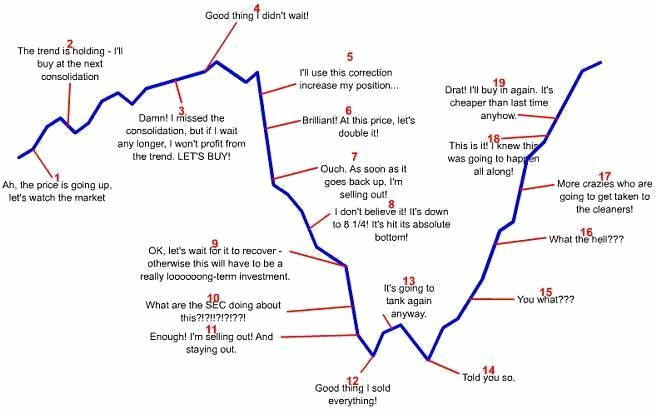 This “Buy High, Sell Low” approach is the reason many people lose money when they make snap decisions based on emotion. But with nearly every market down right now, you can make some moves to realign your portfolio without worrying about “locking in” your losses. Talk to your advisor about a plan to be in position for your investments to take advantage of the market recovery. No one knows exactly when it will be, and by the time it’s obvious to everyone the lion’s share of the returns will be past. If you really want to get the most out of the rebound, consider making additional monthly contributions to your portfolio. If you have not started a savings plan yet, you can start small ($25 a month goes a long way over your life), but start now. Finally, I highly encourage everyone to look at the new Tax-Free Savings Accounts available now. This is a perfect vehicle for short to medium term savings goals (house, car, education) as well as retirement planning that can complement any plan you have in place today. If you plan to maximize your RRSP, this is a fantastic way to further protect your assets. Again, it’s also a perfect place to start saving if you haven’t before. If you are over 18 you can deposit up to $5,000 this year, you can take it out any time without penalty or repayment (or affecting any income-tested benefits, such as OAS), and any growth is yours tax free. If you have any questions, please leave a message in the comments below, or contact us in the office. Happy New Year!